When Anheuser Busch released the first margarita flavored malt beverage in April 2012, the only flavor that people knew is lime because of Bud Light Lime-A-Rita. After all, lime is the traditional fruit associated with margaritas and it is just right to make it as the flagship flavor of the Rita family of beverages. Although there were people who did not appreciate the drink at all, still, it was well-received by most consumers. 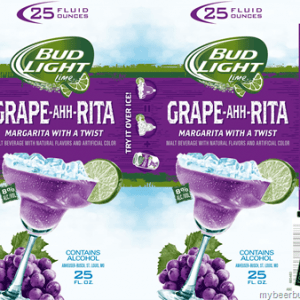 Below are the latest Bud Light Grape-A-Rita prices. The success of the Lime-A-Rita paved the way for the release of other flavors such as the strawberry flavored Straw-Ber-Rita, mango flavored Mang-O-Rita, and the raspberry flavored Raz-Ber-Rita. But, Anheuser Busch did not stop the fun there. More fruit flavored margarita inspired drinks were released in the following years, with some being seasonal flavors, and the others as a permanent addition to the growing Rita family. In winter of 2013, the seasonal cranberry flavored Cran-Brr-Rita was launched, and even extended due to strong sales. Then, there came the apple flavored Apple-Ahh-Rita, the lemonade flavored Lemon-Ade-Rita, the watermelon flavored Water-Melon-Rita, the cherry flavored Cherry-Ahh-Rita, the peach flavored Peach-Rita, and the orange flavored Orange-A-Rita, which was only available in Michigan, Ohio, Florida, Texas, and Georgia. It was in the summer of 2016 when the grape flavored Grape-Ahh-Rita was released. For some reason though, it was renamed to Grape-A-Rita in the summer of 2017. Fortunately for the grape lovers, Grape-A-Rita is not a seasonal flavor, which means it is available all year round. It is perfect for days when you are hanging out by the pool or by the beach, or just staying at home watching a movie. 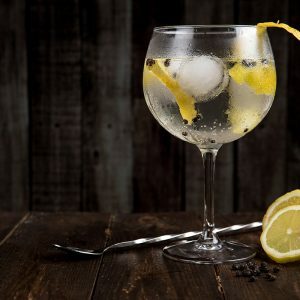 It is a great alternative for those who do not like drinking wine, but love the flavor of grapes in their alcoholic drinks. Grape-A-Rita has 8% alcohol by volume, contains 196 calories, 23.2 carbs, and 0 grams of fat per every 8 ounce can. If you have not tried this alcoholic drink yet, you can grab some in an 8 ounce can or a 25 ounce can. As stated on the packaging, the Grape-A-Rita is best served over ice, but it can also be used to create even more exciting mixed drinks. Below are some of the concoctions that you can try. Combine all the ingredients in a large pitcher and stir well. You can adjust the taste by adding just an ounce of the simple syrup or adding more, if you prefer a sweeter sangria. Take note though that the Grape-A-Rita already contains sugar, so take it easy on the additional sweetener. In a bowl, mix the packet of gelatin and the boiling water. Mix well until the gelatin is dissolved. Then, pour the whole can of Bud Light Grape-A-Rita and give it a quick stir. Pour the mixture in disposable shot glasses and chill for a few hours. You can also put a seedless grape in the glasses before you pour in the mixture for a pleasant surprise. In a highball glass or a tall glass with ice, pour the simple syrup and about four to six ounces of Bud Light Grape-A-Rita, or until it is 2/3 full. Give it a quick stir. Then, pour the cream to fill the glass. Top with with a maraschino cherry before serving. Chile Vodka: Too Hot For Your Mouth?